The FTUC continues its campaign for $4 national minimum wage in the country. The FTUC calls on Government, Municipalities and all statutory bodies to revoke individual contracts and replace them with Collective Agreements. In March of 2015 and March of 2016, the Fijian Government made an unqualified undertaking that it would respect ILO Conventions 87 and 98 on the right of all workers to Freedom of Association and the right to organize and collectively bargain. Based on that undertaking an Agreement was reached between the FTUC, FCEF and Government. As a result of this Agreement, the ENI Decree and the Public Service Amendment Decree were repealed. The ERP Amendment Act 2015 and 2016 restored these fundamental rights to all workers. This resulted in the FTUC agreeing to withdraw its complaint to ILO under Article 26 for an ILO Commission of Inquiry. While we have amended the laws, we find Government, Municipalities and Statutory bodies continuing to insist on Individual Contracts for workers. An unequivocal undertaking and the amendments of the law is not sufficient. We need to see that these rights are put into practice. Individual contracts go against the very spirit of collective bargaining and gives workers little or no job security. Employers can at will, without cause, terminate contracts and we see many instances where this has occurred. Bio Security of Fiji would be a case in point where it terminates employees summarily without cause and continues to deny giving reasons for termination despite that being a requirement of the laws of Fiji. Similar cases exist in many Government owned entities and the civil service. Individual Contracts actually deny workers an effective voice at the workplace and forces workers to accept any terms and conditions offered no matter how unfair they may be. We have witnessed a serious decline in working conditions and benefits to workers since the imposition of the ENI Decree. Many Government owned companies and even Banks had simply decided to take full advantage of the ENI Decree to reduce benefits and force workers into fixed term contracts from 1 year to 3 years. Some have even gone to the extent of only giving three month contracts which is renewed every three months just so that workers do no accrue long service or other benefits. This is outrages and grossly unfair and a clear strategy to exploit workers. This is tantamount to denying workers any rights and to bonded labour. Workers are unable to plan their families and in many cases are unable to get loans from banks and other financial institutions for housing, health, education or even social commitments, the very essentials of life. Clearly this does not fit the definition of “Decent Work” which this Government has also committed to ensure and which is an integral part of UN Sustainable Development Goals (SDG). This also does not also fit into the definition of the right of workers to fair labour practices prescribed in our Constitution under the Bill of Rights. This is a clear violation, to the contrary. The FTUC remains very concerned at the refusal of some Municipalities to enter into negotiations with Unions. The Ministry of Local Government appears to be the only authority that approves these processes and vets any claims by unions and outcomes. This is a clear demonstration by the Minister and his Ministry of the lack of confidence in the Special Administrators and the desire to micro manage Municipal Councils. It appears to be all about total power. Temporary individual contracts in permanent jobs are rampant in almost all municipalities. It is clearly time for democratic elections for Councils. The ratepayers must have their rightful voice. The excuse that a review of the Councils will take place prior to the elections is nothing but an excuse not to have elections so that Government can have total control. The FTUC calls upon Government to scrap all individual contracts and revert to the contracts with full tenure as in the past. The excuse that fixed term contracts hold workers to account and improves productivity is nothing but a farce. In fact it disempowers workers and makes them feel insecure both professionally and socially. It once again brings back the “master- servant” relationship which was dismantled many years ago through collective bargaining. Dignity at work is an essential element of Decent Work. The Government has to lead by example and must demonstrate its commitment to Freedom of Association and Collective Bargaining. I call upon Government to enter into dialogue with the Unions to ensure fair working practices are in place and Decent Work is achieved in reality. Individual contracts for management positions and highly skilled positions are understandable but must not be imposed. The imposition of individual contracts on the Civil Service, Municipal Councils and Government owned entities and banks to deny workers the right to Collective Bargaining a “badge of shame” for workers and human rights and needs immediate review and redress. We the undersigned support the call from Fiji Trades Union Congress to review the National Minimum Wage currently paid to workers from $2.32 an hour to $4.00 an hour. This is necessary because it has become impossible to survive, on the current National Minimum Wage due to the increase in cost of living and the absence of any real wage adjustments including the Wages Regulation Order (WRO) over the past many years. We recall your promise to the people of Fiji to make Fiji a more Just society where no Fijian is left behind. The current wage level has forced a large number of Fijians into poverty and extreme poverty. We therefore urge your Government to be mindful of the plight of workers and their families and increase the minimum wage to $4.00 an hour as the National Minimum Wage. THE Government’s $2.32 minimum wage is condemning unskilled workers to a life of poverty and exploitation by businesses, claims the Fiji Trades Union Congress. FTUC National Secretary Felix Anthony said while they welcomed the recent announcement by Employment, Productivity and Industrial Relations Minister Jone Usamate that Government intended to review the minimum wage and wages regulations orders, he called for widespread consultations. “Government has repeatedly said in domestic and international forums that it wants to eradicate poverty,” he said. “And the only way it can do this is by ensuring that every worker earns enough to cover basic food items, housing needs and pay for utilities — their water and electricity bills. Any wage that does not allow them to do that is nothing short of a farce. “We believe $4 an hour is a good starting point. A worker on this rate earns about $150 a week and when you take into account the cost of food, transport, housing and utilities, this will allow a worker to provide decent meals and shelter for his or her family. Mr Usamate, who is abroad, said he would respond to questions sent by this newspaper on the comments made by Mr Anthony upon his return. Implementing the Education 2030 agenda in the Asia-Pacific region was the focus of a regional consultation of education union leaders. The Education 2030 Agenda and sustainable development goals (SDGs) were the focus of the Regional Consultation on Education 2030 Agenda, organised by the Education International Asia-Pacific (EIAP) regional office in Bangkok, Thailand, on 15-17 December. The meeting was attended by over 25 teachers’ union leaders representing 17 education unions in Cambodia, Fiji, Indonesia, Malaysia, Myanmar, the Philippines, Pakistan, Thailand and Vietnam. Representatives from UNESCO, the International Labour Organisation (ILO) and Action Aid International also participated in the consultation. Applauding the Education 2030 agenda, participants agreed wider collaboration was required to achieve the SDGs. In addition, the education agenda must be integrated into the agendas for decent work and the gender equality. This is necessary to promote quality education for all, end discrimination and exclusion, and ensure decent work for all workers, including teachers. Attendees also highlighted that the Education 2030 agenda will not be achieved unless governments in the region improve access to and quality of public education. They must also strengthen the public education system by providing adequate funding, appointing trained and qualified teachers, improving school infrastructure, and creating child-friendly schools. Anand Singh from EI also called upon the education unions to work harder together to ensure that their governments’ commitments are translated into action at national level. At the end of the consultation, participants developed advocacy strategies to put pressure on governments to implement the SDGs. Plans focus on raising awareness of SDGs among union members and the public in general, social dialogue with the government and stakeholders, networking and building solidarity with trade unions and civil society organisations, and the dissemination of information on SDGs through various media, including online platforms. Participants also decided to mainstream advocacy and awareness on the Education 2030 agenda in the union programmes and activities. 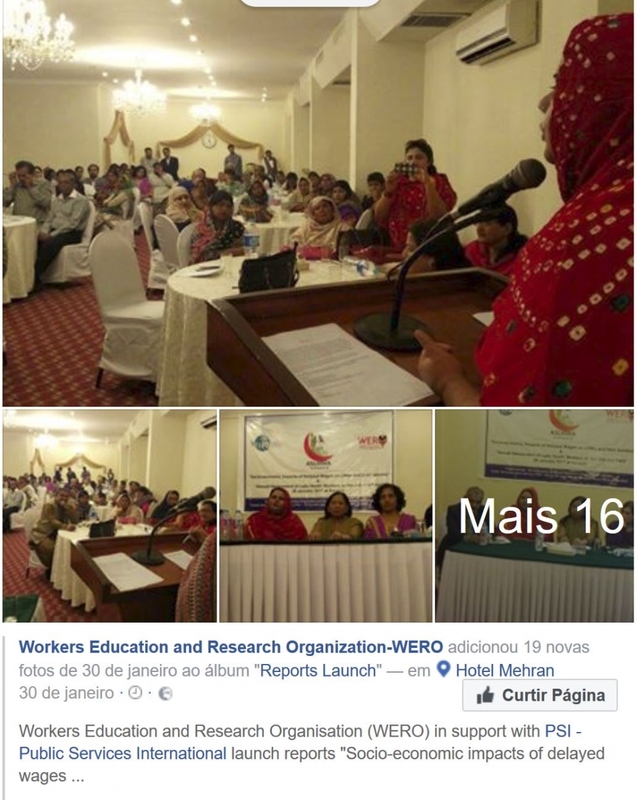 On 30 January, the All Sindh Lady Health Workers and Employees Association, PSI and Workers Education and Research Organisation organised a public meeting in Karachi on “Socio Economic Impacts of Delayed Wages on LHWs and their families” and “Sexual Harassment of Lady Health Workers on the Job and Field” to share the findings of two studies to be published very soon. Lady Health Workers (LHWs) are part of the National Programme for Family Planning and Primary Healthcare, started in 1994. Under this program, women provide family planning, pre-natal and neonatal care, immunization services and other key child and women health services in the community. It has been shown that maternal and infant mortality rates are lower in areas where LHWs are active. Findings include that 63%of the respondents are the sole breadwinners of the family. However, they reported an average monthly income of PKR 15,245 (137 euros), whereas their monthly expenditures stood at PKR 29,567 (265 euros). Uncertain job descriptions, long working hours and erratic traveling are other issues faced on a regular basis. Wages are generally not paid on time, and the All Sindh Lady Health Workers and Employees Association (ASLEHWA) has been instrumental in pressurizing the government in releasing salaries. The programme is a major employer of women in the non-agricultural sector in rural areas. There are 125,000 LHW in Pakistan, out of which 22,576 are in Sindh. Further due to the fact that their work makes them step over the gender division of public and private space, LHW face humiliation and verbal abuse by members of the communities they serve, domestic violence at home and sexual harassment at work by their colleagues in the health system and in the field by members of the community. Most of these instances go unreported due to the fear of repercussions. In many instances, LHW reported being worried that their families would ask them to leave the job or even disown them. Cases of extreme violence include orchestrated murders by religious fundamentalist groups, estimated at 22 deaths since 2012. Recommendations included revising salaries structures commensurate with qualifications, awareness campaigns among LHWs and their colleagues in the health system on laws and mechanisms relative to the protection against sexual harassment. Mechanisms should also be set up in the districts to monitor violence and sexual harassment cases by community members. Educators have launched a campaign demanding sustainable funding for preschools, which they see as vital for a childâ€™s development, giving them social and educational skills they need to achieve at school. On 3 February, the Australian Education Union (AEU), an Education International National Affiliate, launched its ‘Protect Our Preschools’ campaign, calling on the Federal Government to guarantee ongoing funding for preschools and to end the uncertainty facing parents and education personnel. While over 95 per cent of four-year-olds in Australia are enrolled in a government-funded programme of 15 hours per week of preschool, this programme is under threat from public authorities that will not guarantee its share of the funding beyond 2017. This has prevented preschools from being able to plan for the future, putting educators’ jobs at risk. All children deserve access to quality preschool to help prepare them for school, said AEU Federal President Correna Haythorpe. The union’s new campaign will promote the value of preschool and put further pressure on the Federal Government to provide long-term funding. “Education Minister Simon Birmingham has spoken repeatedly about the benefits of preschool; he needs to do more than talk, he needs to give preschools the funding certainty they need,” she stressed. Haythorpe highlighted how research shows that quality preschool is the best preparation for a life of learning, because it boosts readiness for school and lifts results in the long term. She questioned why the Federal Government would even consider cutting funding from programmes that deliver huge benefits to children. Every child deserves a head start on learning and access to 15 hours a week of preschool, taught by a university trained teacher, Haythorpe said. This campaign gives parents and educators a voice to tell the Turnbull Government that all children deserve 15 hours of preschool. Australia already invests far less in early childhood education than the average in Organisation for Economic Co-operation and Development (OECD) countries. Its national funding accounts for just 0.5 per cent of gross domestic product (GDP) compared to the OECD average of 0.8 per cent, Haythorpe said, adding that “this flies in the face of research that finds that preschool is cost-effective way of lifting school performance”. On 14 February, an international solidarity action with workers of the Rustavi Azot chemical plant, and the Trade Union of Metallurgy, Mining and Chemical Industry Workers of Georgia (TUMMCIWG), took place in Rustavi, Georgia. The rally was held under the banner of IndustriALL Global Union to protest the dismissal of 350 workers from the plant. Representatives of affiliates from Armenia, Belarus and Kyrgyzstan participated, and TUMMCIWG received letters of support from trade unions in Moldova, Russia and Ukraine. Gocha Aleksandriya, deputy chairman of the Georgian Trade Union Confederation, told participants about steps made by unions to resolve the conflict. He said that the government had ignored the company’s violation of the law, and that the owner, Efrem Urumashvili, was lobbying in the corridors of power. Tamaz Dolaberidze, chairman of TUMMCIWG, read letters of solidarity from IndustriALL affiliates and reported on the results of a media investigation on violations of sales procedures at Rustavi Azot. Eduard Pahlevanyan, chairman of Branch Union of Trade Union Organizations of Miners, Metallurgists & Jewellers of the Republic of Armenia, and Taalajbek Kudusov, member of the Presidium of Mining and Metallurgy Trade Union of Kyrgyzstan, also expressed support for the workers’ demands. Tamaz Dolaberidze attempted to enter the company premises, but he was denied access. To sign new contracts in the presence of a union representative. The owner stated through the Ministry of Labour that there would be no other positive steps. The company appears to be hiding from the union. Union representatives are unable to find a legal address to send official letters. The administration does not accept letters at the director’s office, stating that a company is not registered here. The union will probably only be able to formally interact with the employer in court. The authorities, who act as mediators, seem to unofficially support the employer. The owner claims that mass lay-offs are due to the high price of natural gas that has made production unprofitable. Instead of negotiating with government about possible tax incentives for saving jobs, the authorities and the owner resolved the situation in the most convenient way, firing workers and shifting the burden onto them and their families. The ITF (International Transport Workers Federation) is giving a warm welcome to the major new Maritime Labour Convention provisions on crew abandonment that will come into force tomorrow (18 January 2017). The ITUC has condemned the imprisonment by the Bangladesh Authorities of at least 26 garment workers, including several union representatives, for participating in strike action in favour of a living minimum wage. Trade Union offices in Ashulia, the garment-producing hub of the capital Dhaka, have been invaded, vandalized and forcibly shut down, with membership documents burned and furniture removed. More than 1,600 workers have been fired and police have filed cases against 600 workers and trade union leaders. Sharan Burrow, ITUC General Secretary, said “Bangladesh has an appalling record of abuse and violations of fundamental workers’ rights and this latest round of repression against impoverished garment workers, who are simply asking for a wage that provides enough for them and their families to live on, is a disgrace. The government’s long-standing anti-union stance leaves workers living from hand to mouth, and deprives them of the means to demand safe working conditions. We demand that these workers be released, and that the government live up to its obligations to respect fundamental labour rights. The maritime sector, despite some decline in recent years, continues to be critical to economic development and day-to-day survival in some Pacific Island countries. It remains an important source of jobs and income in the Pacific region and generates remittance transfers from seafarers of up to 25 per cent of GNP in some countries. However, if left unregulated, Pacific seafarers can be vulnerable to exploitation, while shipping registries may be unable to maintain competitiveness without the adoption of international standards. The Maritime Labour Convention, 2006 came into force in 2013 and consolidated a number of existing maritime labour conventions and related recommendations. The Maritime Labour Convention (MLC) , is designed to help achieve the twin goals of ensuring a ‘level playing field’ for quality ship owners and establish improve conditions of work for seafarers by prescribing certain minimum conditions of work. The MLC has been widely ratified among Pacific island ILO member States including Tuvalu, Kiribati, Palau, Marshall Islands and Samoa. However, in some cases, member States require capacity support to implement the requirements of the Convention. Since 2009, the ILO Office for Pacific Island Countries has provided tailored support to ILO member States to ratify and implement the MLC. This included engaging the Pacific International Maritime Law Association to conduct gap analyses of existing law. The ILO also held a range of awareness raising meetings with governments, employers and workers and assistance with the development of Action Plans to ratify the MLC. Where possible and practicable, the Office has supported officials to attend training on the MLC at the ILO’s International Training Centre based in Turin. FTUC Stages Protest In Support of Workers In India, Despite Denial of Permit.